Yes our sweet PoppyQ got her blog back. PHEW, we would have missed her so much! Now we also have a link from Jan's Funny Farm about the picture issue. 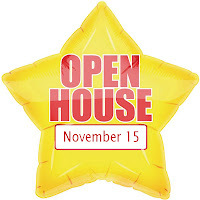 So go HERE to check it out. Maybe we can prevent others having issues and getting locked out or losing their blog. Although when we logged in we had the same issue as Poppy. We had to sign up for Google+, which we will never use. Then mum did pay for more room, but we can't seem to be able to size things like Jan says we can. Update; Mum figured out how to resize but we have several thousand pictures. It will take mum a while to redo things. Oh, yeah, the feetsball report. The Slackers, oh, that would be Packers, stunk up the field on Sunday night. Mum got tired of watching the game. So while she kept the TV on, she mostly readed her book. HiYa, Ducky here. We all survived the holiday weekend. Mum is bummed she has to go back day hunting today. She enjoyed her week off, got her stuff done. We enjoyed having her home too. Lots of time for cudddles and scritches. Of course we did lots of this too. Lots of naps. Bleepy, bleepy Blogger is running a lot of kitties out of picture storage. Lots of us hit this last week. Poor PoppyQ got locked out of her account when her mum tried to work on her account and she put in Poppy's real birthday. So be careful, make sure your mum makes you old enough to have an account. We hopes we didn't lose her for good, we loves our PoppyQ. The Pack - is playing on Sunday night. Mum says she will likely stay up to watch the game, but won't leave the puter on to give the results. The Broncos - They won, out scoring the KC Chiefs. Everyone have a good week, not long until Santa Paws gets here. We sent mum shopping for our Secret Paw. We have the stuff we want to send, but mum needs to find a box to send it in. HiYa, Ducky here. Hope all of our Meriky furiends have been having a good holiday weekend. Me hanging out with my little cat ducks on top of the cabinet. Furry roomy here right now as something is missing from up here? Remember what should be here? Yep, mum's ticky tock clock! It went it for some TLC at the shop a few weeks ago. Mum says it is so quiet without it and no chimes or ticky tock making noise. Plus the little tree should come back soon too. This was mum's T-Day dinner, not turkey but duck. The fevver kinda duck, not me of course. Grilled to a nice crispy doneness. We got some duck too, but not from this meal. Mum remember my sweetie Dora had sent some treats to me a while back and they were made of duck. They are quiet nommy, mum put out a small pile for me to try. I snarfed them right up. All gone Derby! Mum did give him his own little pile to eat. We like the package message. Kitties get grump and sad without fresh water! Plus when we were doing our post the other day, we ran out of picture storage room and so did a lot of other kitties. Hmmm, that we all ranned out on the same day, that makes mum suspicious! Plus since they changed over to this new blogger, you could never tell how close you were coming to be full. We send razberries to blogger people, we thinks you just want to make more money. Mum did pay for us to have more pictures, as we like to post pictures. Have a good rest of the weekend. It is now furry cold here, so we are doing our best to keep warms. 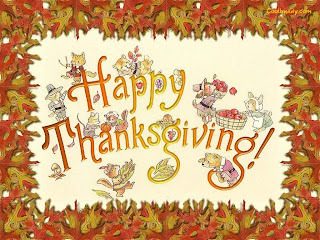 Happy Turkey Thanksgiving Day to all our our Meriky furiends. We hope you have a wonderful day, be thankful for whatever you have. 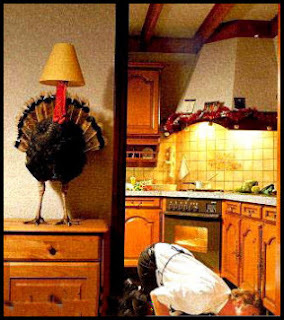 Hope your turkey doesn't hide on you. Travel safe, don't eat or drink too much, don't drink and drive, enjoy your family and furiends, smile and have a good time, if only for the day. Mum will be hanging out with furiends and says she will be having duck! Not Ducky, but duck. Don't know if we will get any taste, not sure if mum will get some left overs to bring home. Mum finished her list of things to do on Wednesday. She even did a few things that wasn't on the list, but ended up doing them as well. Mum even finished reading her long book and picked up a few more to read from the library. She was happy as they were two newer books which normally only have a two week lending period. But, mum knew that with the new software change coming next week she could get them for the full four weeks. Mum says it helps to be on the library board and know these fun things. So we can relax, less to snoopervise since mum is done with her list of stuff to do. Guess we will take some nice naps in the sun. It has been nice weather, bits of open windows and sunshine. 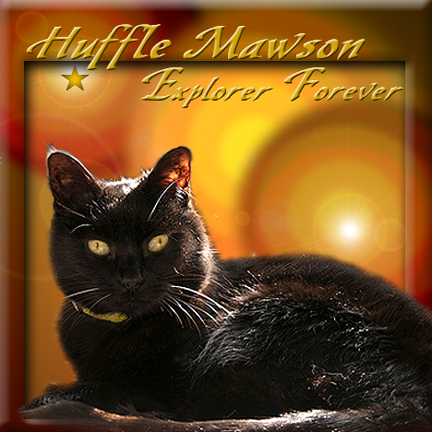 Farewell dear Huffle. We will miss you lots. Your sitting in the planting pot, wished we could do that. Run free at The Bridge. Lots and lots of purrs to your beans. Yes, mum got that huge pile of stuff gone from the bed on Monday. So I have my napping spot back, where I can take over the whole sleepy spot. Do you spy me? My ears gave me away, mum saved the box for another day for us to play in. OK you can go away with the flashy box now, it is terribly bright. Just go. Mum has over half of her week off chores done. The hardest stuff is already done, so just smaller tasks to do and they are likely to be done on Tuesday. Then she has one appointment on Wednesday. Then it is on to Turkey Day. Well, guess that is why there are more crazy cat ladies, and not crazy cat men. But then of course we have Not the Mama of Purrchance to Dream. Mo is a cat man magnet if anyone is a cat magnet! The bestest news we have is that we have a mum week. She has a big piece of paper that says "Week Off". But below that she has listed a whole lotta stuff that she needs to get done before she goes back to day hunting. You can see the red lines, those are the things she has already finished, but then she keeps adding things too. Her biggest project is to clear out stuff she doesn't use and most of that is clothes. Mum says she has way too much stuff, old stuff she hasn't worn in ages. Or too many of the same thing. So this was the pile about noon time on Caturday. Then after lunch is attacked the linen closet. I Derby used to be able to get into this often, then mum kept putting stuff in and more stuff in. See, now Ducky can get in and sit on the bottom shelf. Here is a bit off the pile of stuff mum says she could add to the, it is going away pile. All done, looks nice and mum can actually find stuff. She found stuff she forgot she had and then she goes and gets more! All of the hand lotion and shower gel stuff is now in a different spot where she can easily see what she has. The final pile! It includes some winter coats and other peoples will be happy to have something warm to wear at this time of the year. After the feetsball game mum went out and put some lights on the house. It wasn't that dark yet when mum took the picture, but since we don't get much snow the last few years, mum wanted to brighten up the outside. They will be officially lighted on Friday. The Pack - the sort of good team showed up. They won, but not by much. Mum says she thinks they need to get a new kicker, he isn't doing good now and he used to be really good. If it isn't the foot it is his brain. The Broncos - They played the left coast team from Sandy Eggo and beat them. So they are in first place in their division. Have a good week all. To our Mericky furiends, if your beans are travelling, please do be safe. Can you make out a bit of a furry body up on the tree? Mum went out to fill up the fevver feeders so we can count fevvers this weekend. She heard some clicky claws on our little tree. Guess what she saw? A masked introoder. Mum managed to get a few pictures of our masked visitor. Mum says it is hard to focus at something in the dark. We are planning a quiet weekend, mum has a huge list of stuff to do. We will snoopervise and nap in between. Yes, that white stuff is snow. We gots a little bit of the flakes late Monday. Caturday and Sunday it was nice enough to have open windows. Monday it was 40 degrees colder! Yikes. Last time we had the white flakes and really cold was way back on March 8. That is back when mum went in for her major medical overhaul. That was a long time ago. 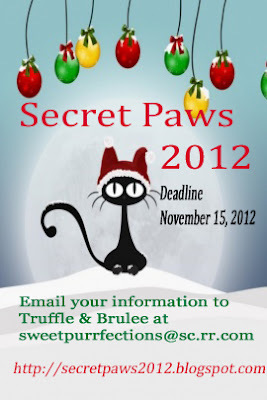 You need to sign up by Thursday the 15th at the latest. 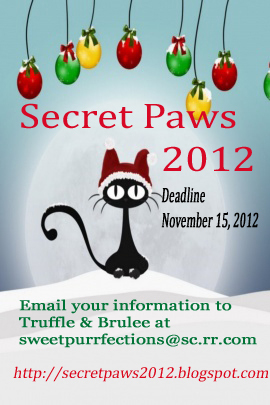 Go to the Secret Paw website to sign up if you haven't already done so. 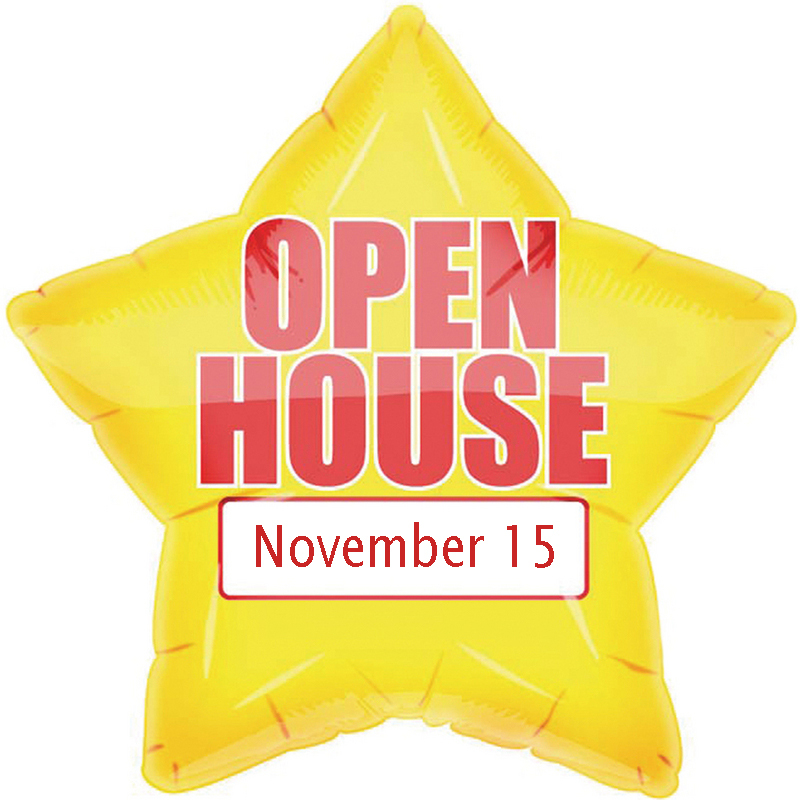 Plus the Tabby Cat Club is having a party for their first blogoversary.So stop by, we will! We had a wonderful weekend! It got sort of warms, so mum opened the windows for us. Her sleepy room window was open all night. It was so good to sniff the fresh airs again. It is going to get all cold on us, so we won't have much chance for open windows in a while. Just the two of us hanging out. I was bugging Derby and pushing under the little bed. Me waiting for mum to come and count fevvers. Being warm and windy, we didn't see lots of fevvers, but we did see Mr Hawk. 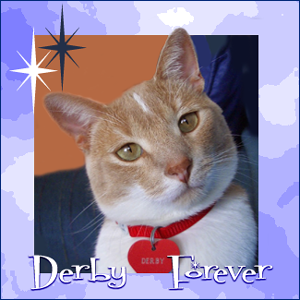 Derby coming by to help us watch for fevvers, this is a nice group activity for us. Oh, and it seems I have a new business. 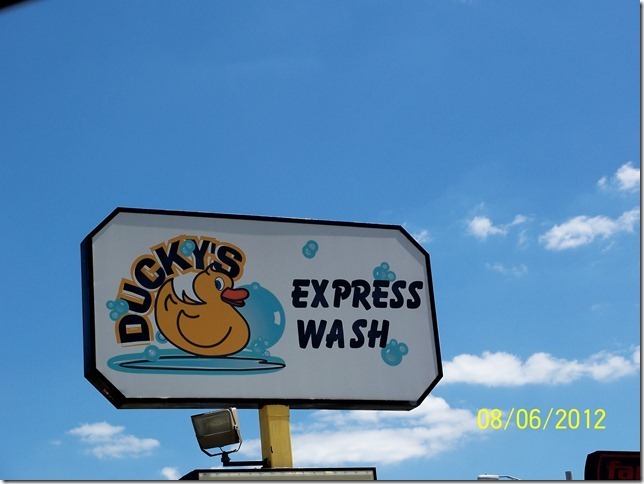 Come on through for an express wash. The Pack - They got the weekend off, time to rest up, let some of those aches and pains to fade away. Time to get ready for the end of the season push. The Broncos - They won, beating the black panther guys of Carolina. But mum was watching the game, went to get the laundry from the basement, they had switched to a different game! Mum was not happy, so she turned off the moving picture box and opened her book. Thank you to all who have served in the military, who have kept our country free and serve to help others to freedom as well. We know that freedom is not free. 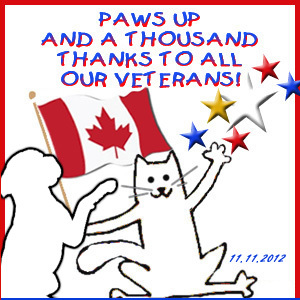 A quick history, what we now call Veterans Day started out many, many years ago as Armistice Day. It marked the day when "The Great War" or World War I ended and the major hostilities were formally ended at the 11th hour of the 11th day of the 11th month of 1918 with the German signing of the Armistice. 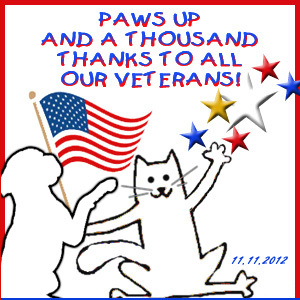 Then many years later some beans got together and said the day should be to honor all military veterans. 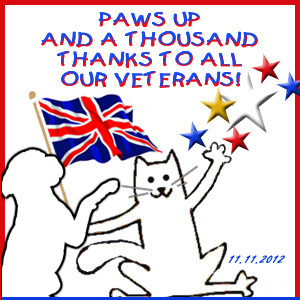 So they changed the name from Armistice Day to Veterans Day. Mum says she remembers being in school and at the 11 hour of the 11th Day of the 11th Month. They would stand and face east in a moment of silence. 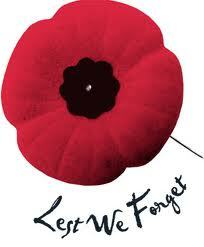 Other countries may observe the day as Remembrance Day, like in the UK and Canada. 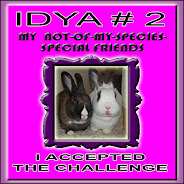 Here is the moovie that mum thought she uploaded a few weeks ago. Derby invading the hot rain room. It is rated G, you won't see mum nekkid. They keep changing the weather for the weekend. First nice and warm and sunny. Now they are saying rains! If it gets nice, mum can let us have some open windows for a while. Mum says it will be a quiet weekend. The Packers get the weekend off, so mum won't have to sit and watch feetsball. She may watch feetsball, but she won't have to watch. Hello all, Virginger here. Well I think we can consider the garden closed now for the year. The dogwoods have dropped their leaves and you can see the bright red branches. If we get snow they show up really well against the white snow. All of the chairs are put away. Mum won't be sitting out here anytime soon. The outside cooker thingy is under its cover for now. Mum doesn't use it during the winter. Dark outside to cook after work. The fevver feeding station is in clear view for mum and the boys to watch and count fevvers. Project feeder watch starts this weekend. Mum has the counting stuff all ready to go. Mum even bought a new fevver feeder to try out. This is for the goldy finches. We haven't seen many fevvers eating at it yet. That should be all for this garden season. We will see you on Feb 26 for sure for Squillion Day and next spring in the garden. 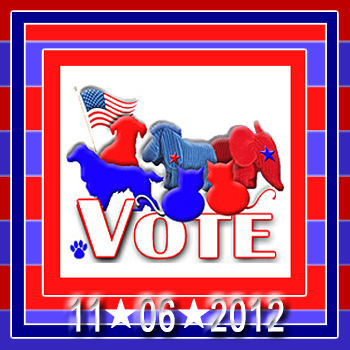 A big reminder to all of our Mericky furiends, specially their beans, tomorrow is election day here. So if you didn't vote early, tomorrow is your last chance. If you don't vote, them mum says you don't have the right to complain about what happens. Mum will also be happy that the phone will stop ringing with people calling we do not know. Most likely on election stuff. Getting two or three calls a day. That interrupts our naps! 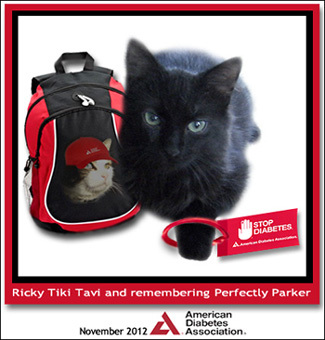 Next on our public service announcements, in honor of Perfectly Parker, alerting you to National Diabetes Month. It is a nasty disease to have, yes it is treatable, better yet if you don't get it. So eat good, try to keep your weight reasonable and exercise. Mum tries all of these and she hopes she never gets diabetes. Mum finished up most of the outside work over the weekend. She went walking on the roof to get the leaves out of the rain gutters, then cleaned up the last of the leaves. Just needs to mow the grass one last time and chew up the last of the leaves too. We tried to have a quiet weekend. Mum did work outside. Virginger snoopervised, us too. We rested while mum watched the Packers play feetsball. We do ok until she starts cheering, clapping and making lots of noise. Then we leave. Mum even finished up the baby blankie she was making. She worked in and then cut off all the loose ends. I didn't care for the yarn on my head. Then put it into the pretty bag. The Pack - The won, the decent team showed up, did some good stuff. They got those red birds to fly away from Lambeau with a loss. The Broncos - They won too. Taking down the Bengal gusys.